List of Contributors. Preface. Acknowledgements. Section I. Introduction 1. Minding the mind (E.A. Mayer, C.B. Saper). Section II. Relationship between mind, brain and emotions. 2. Topography and relationships of mind and brain (B.A. Vogt, O. Devinsky). Section III. The neurobiology of the stress response. 3. 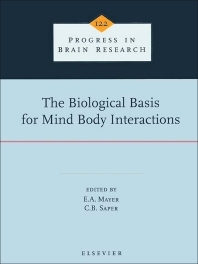 Protective and damaging effects of stress mediators: central role of the brain (B.S. McEwen). 4. Interactions between the immune and neuroendocrine systems (E.M. Sternberg). 5. Depression really does hurt your heart: stress, depression and cardiovascular disease (D.L. Musselman, C.B. Nemeroff). 6. Circuits and mechanisms governing hypothalamic responses to stress: a tale of two paradigms (P.E. Sawchenko, H.-Y. Li, A. Ericsson). Section IV. Early life experiences and the developing brain. 7. Long-term behavioral and neuroendocrine adaptations to adverse early experience (C.O. Ladd, R.L. Huot, K.V. Thrivikraman, C.B. Nemeroff, M.J. Meaney, P.M. Plotsky). 8. Neurobiological correlates of defensive behaviors (V.P. Bakshi, S.E. Shelton, N.H. Kalin). 9. Effects of perinatal pain and stress (K.J.S. Anand). 10. Early life abuses in the past history of patients with gastrointestinal tract and pelvic floor dysfunctions (G. Devroede). Section V. Influences of the internal environment on the brain. 11. Responses of afferent neurons to the contents of the digestive tract, and their relation to endocrine and immune responses (J.P. Furness, N. Clerc). 12. The controls of eating: brain meanings of food stimuli (G.P. Smith). 13. Effects of nutrients on brain function (T.J. Maher). 14. The evolving neurobiology of gut feelings (E.A. Mayer, B. Naliboff, J. Munakata). Section VI. Influences of the body on the brain. 15. Integration of viscerosomatic sensory input at the spinal level (R.D. Foreman). 16. The medial pain system, cingulate cortex, and parallel processing of nociceptive information (B.A. Vogt, R.W. Sikes). 17. Pain as a visceral sensation (C.B. Saper). 18. Pain modulation: expectation, opioid analgesia and virtual pain (H.L. Fields). 19. Mechanisms of analgesia produced by hypnosis and placebo suggestions (D.D. Price, J.J. Barell). 20. The role of vagal visceral afferents in the control of nociception (W. Jänig, S.G Khasar, J.D. Levine, F.J.-P. Miao). Section VII. The influence of brain and mind on the body. 21. Affect, cognition, the immune system and health (M.E. Kemeny, T.L. Gruenewald). 22. Memory networks in the prefrontal cortex (J.M. Fuster). 23. Nonconscious brain processing indexed by psychophysiological measures (D. Tranel). 24. Brain mediation of active and passive emotional coping (R. Bandler, J.L. Price, K.A. Keay). 25. Specificity in the organization of the autonomic nervous system: a basis for precise neural regulation of homeostatic and protective body functions (W. Jänig, H.-J. Häbler). 26. The impact of emotions on the heart (R.L. Verrier, M.A. Mittleman). 27. Neural influence on immune responses: underlying suppositions and basic principles of neural-immune signaling (D.L. Felten). Section VIII. Practical use of mind - body interactions in medicine. 28. The cost-effectiveness of mind/body medicine interventions (D.S. Sobel). 29. Towards an integrative model of irritable bowel syndrome (B.D. Naliboff, L. Chang, J. Munakata, E.A. Mayer). 30. Bridging the gap between mind and body: do cultural and psychoanalytic concepts of visceral disease have an explanation in contemporary neuroscience? (N.W. Read). 31. Complementary and alternative medicine (CAM): epidemiology and implications for research (D.L. Diehl, D. Eisenberg). 32. Biological mechanisms of acupuncture (D.J. Mayer). 33. Intricate tactile sensitivity: a key variable in western integrative bodywork (D.H. Johnson). 34. The science of breathing - the yogic view (R. Sovik). 35. Exploring the nature and functions of the mind: a Tibetan Buddhist meditative perspective (L. Rapgay, V.L. Rinpoche, R. Jessum). @from:(K.V. Slavin, MD, University of Illinois at Chicago College of Medicine) @qu:(...)Both researchers and clinicians will find information from this volume interesting and stimulating. Written by specialists from six countries, it may serve as a current, up-to-date reference source on the title subject. An attractive feature of this volume is the wide spectrum of topics covered(...)The book is well illustrated; all chapters are well referenced; the index is large and complete.